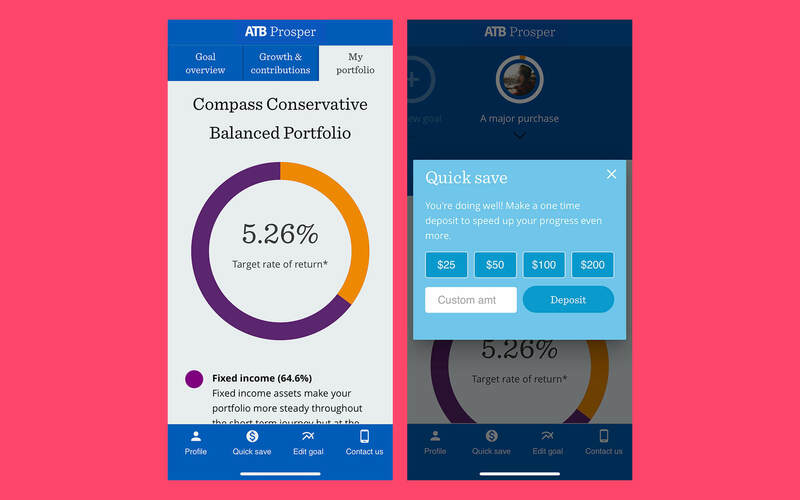 It’s been a few months now that I’ve been working with ATB Financial highlighting its ATB Prosper digital investment experience, and I’ve truly enjoyed the journey. I’ve gotten a lot of great financial tips (that I’ve also shared with you in this previous post! ), and I’ve been putting those tips to action with my own personal finances. Have I had a few weak moments and bought a few new outfits for an upcoming trip even though I said I would try not to buy as much clothes this year? Sure. Yes, no one is perfect! lol. But in the last few months I’ve also been eating out less (it’s true!! ), I’ve set up an automatic scheduled deposit also known as a Pre-Authorized Contribution (PAC) for my RRSPs and I opened an ATB Prosper Investment account. The ATB Prosper account is what I’m most excited about! I’ve never invested my money before, only saved. I’ve always been pretty risk averse when it comes to my money, and honestly lazy—didn’t want to go into a branch to sort out what I needed to do and do it—seriously, that can be a barrier. Enter ATB Prosper, Alberta’s first digital investment experience! I didn’t realize setting up my first investment account could be so quick and easy. 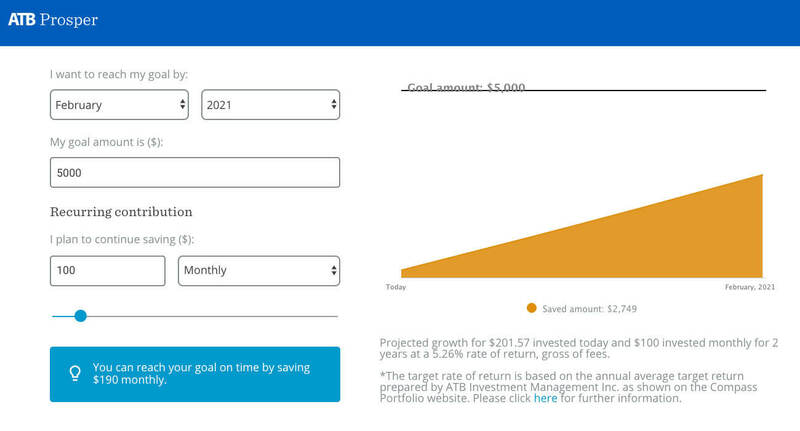 I like how the ATB Prosper digital investment tool shows you projections for how your money will grow! Officially, ATB says you just need 10 minutes and $100 to open an account. And it’s true! It’s also true that you can do it entirely online or through its ATB Prosper Dashboard app, without once talking to someone on the phone or going into a branch. Busy (or lazy) lifestyles, rejoice! It really did take me less than 10 minutes to start my ATB Prosper account. All I had to do was answer a few questions! First, it asks you what you are saving for, as well as your comfort level with investing money. Then it asks about your current assets and liabilities. It gives you a great chart that shows how much you’re projected to save with how much you’re interested in investing each month, based on a recommended investment portfolio (which is determined by the first few questions you answered about your risk aversion and goals). It also gives you recommended timelines for your investments required to reach a goal, but you can choose whether your deposits are biweekly, monthly or annually. If you want it to take money directly from an existing bank account, you just provide your banking information right in the dashboard. It was a very simple and straightforward process! 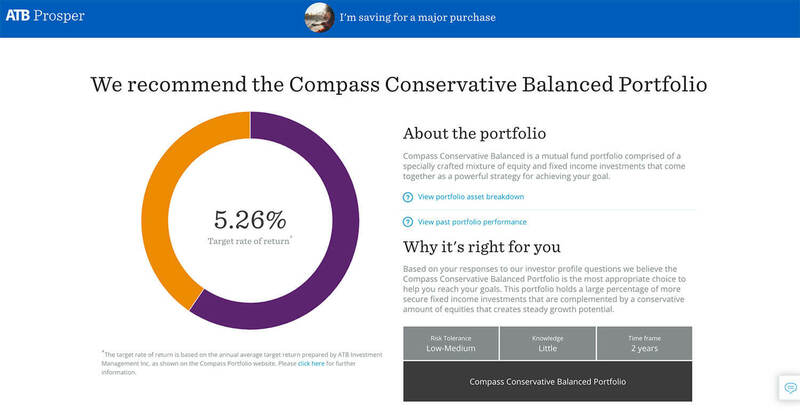 A low-to-moderate risk portfolio was recommended for me based on my answers to ATB Prosper’s questions! After my account was created, I was presented with a nice dashboard where I can check how my investment is doing, see if I’m on track for my savings goal, make one-time deposits to speed up my progress, edit my goal or add new savings goals! But as I already mentioned, you can also download the ATB Prosper Dashboard app, allowing you to check your investments whenever and wherever you wish. I can easily check my investments through the ATB Prosper App! I really liked how fast and simple creating the account was, and how I could do it entirely on my own, online. I also like how you can start with a really low figure for monthly contributions, and choose to add more one-time deposits or dial up your monthly contributions later on if you wish. Now I can officially say I’ve “got a few investments” and I did it completely digitally! I’m excited that I’m all set up for investing with ATB Prosper, getting one step closer to achieving my dreams. However, I’m even more excited that I get to give away $500 to help you towards achieving YOUR dreams!! Enter to win $500 towards your dreams! 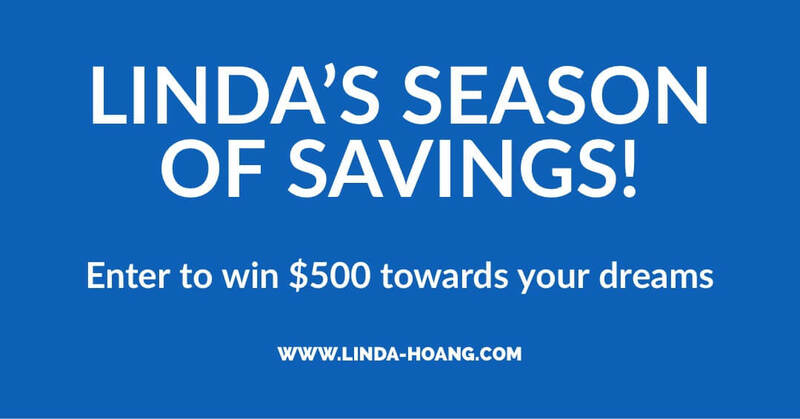 I’m calling it, Linda’s Season of Savings (woot woot!) I’ve partnered with ATB Financial to run a contest this March and another one later in April, where I’ll be giving away a $500 balance to an ATB Prosper account. If you don’t have an ATB Prosper account, ATB will get you started with a cool $500. If you already have an ATB Prosper account, you’ll get a cool $500 placed into that existing account. Fun, right?! Leave a comment on this blog post telling me what BIG goal you are saving for! Note: Leaving a comment on the blog is mandatory for entry. Comments are moderated so if yours does not appear right away, don’t worry! Leave a comment on my Instagram post, telling me what BIG goal you are saving for and tag a friend to spread the word. Leave a comment on my Facebook post, telling me what BIG goal you are saving for and tag a friend to spread the word. This contest runs from March 27 – April 10, 2019. One winner will receive an ATB Prosper investment account with a balance of $500 CAD. If you have an existing ATB Prosper investment account, ATB will deposit $500 CAD into the ATB Prosper investment account. And stay tuned because my Season of Savings continues into April with my next blog post and another chance for you to win $500 towards an ATB Prosper account! Disclaimer: I am working with ATB Wealth in a paid partnership to help highlight its ATB Prosper investment experience. This has no impact on opinions stated in this post. I have created my own ATB Prosper investment account and genuinely thought the process was quick and easy. I’m so excited to finally be investing! I need to be more responsible and have a proper emergency fund! I would love to have a real family vacation, like to Disneyland. I’m saving for our deferred salary year. We’d like to do some traveling with our dogs during that year. Saving up for more travel adventures! I’m saving for my kids’ university and retirement! this would definitely be helpful! going to go check the account out now!! I am saving up to move to Canberra, Australia! My bestie is moving back in July and I was lucky enough to meet her folks last year. Not only are they amazing people, but they also invited me to come and stay with them, when I do come and will be looking for employment. I am super excited to have this opportunity, even tho, it will take at least a couple of years of saving and working part-time. But to be given an opportunity like this, and to be able to have residence too, is amazing and even if I don’t win, I’m super stoked to be able to say that I will be having my “50th birthday” #DownUnder & start my life over again! What an amazing giveaway! The BIG goal I am saving for is to open a yoga retreat business…this would help a great deal to making that dream become reality! Thanks for all the info Linda! I am saving so we can buy a farm… that is our biggest goal! My BIG goal is a new family vehicle so that we can accomplish our travel goals and daily activities in grand style and safety. My GIGANTIC goal is eventual retirement. Thank you. Oh – and the house renos as we are in need of an additional bedroom. Lots of goals but travellig is a big one! I am saving for a down payment for a house! I would like to take my parents on a vacation! Saving for career growth (and maybe a little side hustle)! Keep up the amazing stuff Linda! Saving for the house and travelling to see my family back home. I am saving for a rainy day fund and to get my driveway lifted. I’m saving up to do some much needed renovations. My bathroom is a time capsule from the mid 70’s and it needs to go! We are saving for the future purchase of a house and for graduate masters studies. I would love to use it towards our savings for a down payment for a house. Or as an emergency fund start for car repairs, vet bills, etc. I am saving for my wedding next spring! I’m saving for a house! Thank you so much for this great contest! Travel, I am always saving for travel, and my husband and I are really hoping to get to Japan next year! I’m saving for a new fence! I am saving to be able to take a little trip since it has been so long since I’ve been on one. Paying off some debt and saving to travel! We are saving for some backyard renovations, including a new fence, new deck and a couple new sheds. Saving for my master’s degree! I’m saving for my first house! Don’t be silly. Meowr cats! I’m saving for Spain in December. Thanks for doing this! I am saving to grow my business! I would love to use this money to help pay off my upcoming wedding this fall! We are saving to finish our basement! Hi Linda! My finance and I are saving for a couple big things at the moment! We’ve been saving for a downpayment on a house for the past couple of years, and more recently, we’ve begun saving for our wedding! This would be a tremendous help! I am saving to visit family in Dublin, Ireland!! Saving for a big trip! What a great contest! Saving to build my dream home. My BIG goal is to save up enough money to take my kids and my mom on a trip to the San Diego Zoo! I am saving up to build a small library in my room! I love reading and have been slowly buying some of my favorite books to fill my shelf. I need an emergency fund in case we need to help a sick parent. I’m saving for my wedding and honeymoon! I am saving for a trip to Hong Kong! I am saving up to take an RV trip across Canada with my hubby and my cat, Kitty Mojito. I am saving for a car. Saving so my family of 5 can all go to my sisters wedding next year. I’m saving up to build myself a brand new photography studio. My dream is to have enough space to teach workshops to teens about photography and self-confidence. Kids University,travel, retirement you name it I should be saving for it !!! Aly of Caramunchies and I are looking to grow into our own commercial kitchen! This would be so helpful! Being a recent college grad, my big goal is to get my financial house in order by the end of this year! I am saving for a down payment for my first home! I am saving for an outdoor playhouse and playset for my daughter. Planning a trip to Jordan next year and since I’m recently house poor, this would be awesome! I’m saving up for a down payment! Saving for a trip to Australia! I love you so much Linda! Thanks for al the amazing contests. I’m saving for moving out to an apartment with my boyfriend. I’m saving up to buy a house with a yard for my dog! I’m saving up to build an awesome beekeeping and honey business that my family and I can live on as our full time jobs one day. Saving up for whatever type of costs we are going to have to pay for, for fertility treatments, so we can have an adorable little bb. My dog’s knee and dental surgeries. Girl loves her treats and dance parties! I am saving for my husband and I to take our daughter on her first trip! Destination to be determined, but we are thinking Europe! I’m saving for my education, and potential travel opportunities!! My fiancé and I are saving for our upcoming summer wedding and our honeymoon in Thailand! I would like to complete my backyard for my 10 month old. So she has a place to play as she grows up. She lives to be outside and being on maternity leave has been hard financially. :) Thanks for reading! Our son (9) has autism. Although his progress every day is inspiring more and more hope for us, we also realize that he will most likely need to have constant assistance for the entirety of his life. Once he turns 18, we lose a lot of supports, so it is up to us to make sure he has everything he needs. And those supports are quite expensive. This would certainly help. Thanks for the opportunity. We’re saving for a new house! Hello, I want to make cooking videos in my backyard, with Alberta chefs & local products and my Mexican style. We are saving to do our basement to add value to our house. Saving for a big travel opportunity with my kids, hoping to give them the chance to research and help us pick a dream destination for a family trip next year. They’ve been pretty keen to mention Japan as an option!! This is a great contest. I’m saving to start a family and to purchase all the necessities that babies need. I am saving for my wedding that will be in May 2020! Saving to take my wife somewhere tropical for our 10 year anniversary! Saving for a trip to Greece!! I am currently saving to take my family to Disneyland. It might take a while, but it’s memories I would like. Not stuff. Have a great day, and Good Luck to Everyone!! I need a rainy day fund 100%. A cruise from Dubai to Singapore! My big goal is for a honeymoon! We’re saving up for our elopement/honeymoon in Europe next year! I am saving to take my mom on the only trip she’s ever really wanted to go on: a trip to see the pyramids in Egypt. I’d love to make her dream come true! I am saving to pay off my car. There’s only a few grand left but every little bit helps. I’m saving to update our home furnishings and decorations. We’ve been in our house for over 4 years and it’s still pretty empty. I’ve had people ask us where our stuff is 😅. We are saving money to renovate our house. Especially our basement!